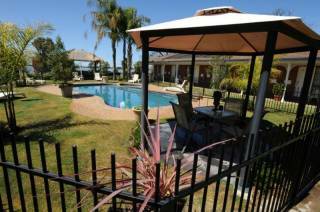 Private and secure resort style holiday house set in a perfect location within walking distance to Lake Mulwala and local clubs and shops. The fantastic pool and outdoor entertaining area is the perfect spot to spend sunny days. Spacious, French provincial style with private courtyards and cosy verandah. Stunning main bedroom boasts full ensuite with large walk in robe plus 2 additional bedrooms and bathroom. Modern kitchen area with walk in pantry and loads of bench space plus adjoining family dining area. Step down family room with split system and overlooks the sparkling pool and picture perfect garden setting. Undercover parking for cars, boats and trailers all securely tucked away. Please supply your own beach towels. A starter kit of coffee, tea, sugar and basic pantry items are provided.